THE project to establish a new airline, Zimbabwe Airways, whose relationship with flag carrier Air Zimbabwe (AirZim) is opaque, is moving towards finality amid revelations Transport minister Joram Gumbo and AirZim chief operating officer Simba Chikore might be caught in a massive conflict of interest storm. Investigations show that Gumbo and Chikore, who is President Robert Mugabe’s son-in-law married to his daughter Bona, have been assisting in the setting up of what is supposed to be a privately-owned airline at the expense of the national flag carrier, AirZim, which falls under their purview and supervision, raising a serious and damaging conflict of interest on their part. Information gathered shows that Zimbabwe Airways is owned by a local firm, Zimbabwe Aviation Leasing Company (ZALC). The company was formed by an identified group of Zimbabwean investors, among them lawyers and businesspersons with interests in the aviation industry. Some of the ZALC shareholders are said to be based in the diaspora. An enquiry with the Deeds Office in Harare indicated ZALC was registered under file number 3015/12. The file was, however, missing from the office, meaning the directors could not be immediately ascertained. But information obtained shows that Zim Airways will take to the skies on November 9 — next week on Thursday — after acquiring four long-haul Boeing 777 aircraft from Malaysia Airlines. There have been widespread reports Mugabe’s family or Chikore is a stakeholder in Zim Airways. The Independent has established Chikore is assisting in setting up the company, purportedly as a consultant while he is a fulltime employee of AirZim. Chikore did not respond to text messages sent to his phone, although they were delivered. Sources said Gumbo was also helping in the project despite him running the line ministry in charge of AirZim. In an interview with the Independent this week, Gumbo confirmed assisting the company but said his ministry was only playing a facilitation role. “When I got into this office in 2015 the government gave me permission to look for a partner for AirZimbabwe,” he said. “I engaged many airlines including Qatar, Ethiopian, Singapore, Turkish, Kenya and many others to partner Air Zimbabwe. The biggest problem was that Air Zimbabwe books are not good enough to attract partnerships. I even went to Ethiopia, Malaysia and Singapore where the airlines were interested, but what made it difficult to conclude the deal were the books. Air Zimbabwe has a huge debt and salary arrears; this made it difficult to attract an investment partner. Gumbo said neither the government nor Mugabe’s family has an interest in Zim Airways, although the company took AirZim’s failed proposal. “This has nothing to do with government; we have no good books to attract partnerships. All we are doing is to assist them,” he said. “This has nothing to do with President Robert Mugabe or government. I told them (unnamed investors) we had initiated talks with several airlines so they just adopted my idea and we took them to Malaysia which had shown interest. They clinched the deal and as minister I am only facilitating just like I am doing on the roads. “We were approached by the Zimbabwe Aviation Leasing Company which said it was seeking partners, so we took them to Malaysia which had shown interest in the Air Zimbabwe deal, but could not take it as long as there were legacy debts. Gumbo also said Chikore had nothing to do with Zim Airways as he remains an AirZim employee. He, however, said Mugabe’s son-in-law was giving “advice” to Zim Airways as he was an “expert” in the aviation industry, without elaborating what was in it for them. “I involved Chikore when I was looking for partnerships, so Zimbabwe Airways are also seeking his advice and expertise. They are talking to him, just like Fly Africa is doing, so that he gives them best advice. He has experience in the aviation field and that is what we want,” Gumbo said. However, sources say Chikore and the Mugabe family struck the Malaysian deal in October last year when the president visited the East Asian country. At the material time Gumbo, who was in Mugabe’s delegation, said he was on the second leg of scouting for partners for AirZim which has been facing many challenges and reeling from a huge debt largely due to extended periods of mismanagement and corruption. Sources also said US$45 million was paid to Malaysia Airways as a deposit for the four Boeing 777 planes. However, Gumbo said his ministry was not aware of the payment. “Our role is to facilitate so we do not even know of any payments ZALC could have paid. They are a private company and we have nothing to do with how they will pay for the planes,” Gumbo said. Although the deal is shrouded in secrecy and thus shadowy, a Twitter user, Jerry Haas, who regularly comments on aviation issues and could be a pilot judging by his posts on social media, has been regularly posting on Zim Airways developments, further deepening the mystery. In June this year, Haas posted first images of one of the planes, a Boeing 777 branded with Zimbabwe Airways insignia and colours, as it completed a two-hour demo flight from Subang airport in Malaysia. This triggered speculation that loss-making flag carrier AirZim would rebrand and lease equipment to use. 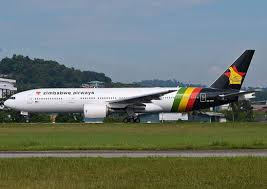 On October 14, he tweeted: “Zimbabwe Airways working on re-joining IATA on US$4,5 million payment done (sic).” This suggested Zim Airways will replace AirZim as he has consistently said. Gumbo is saying the opposite.